Nationality: American. Born: José Vicente Ferrer Otero y Cintron in Santurce, Puerto Rico, 8 January 1912. Education: Studied architecture at Princeton University, graduated 1934; postgraduate work in Romance languages, Columbia University, 1934–35. Family: Married 1) the actress Uta Hagen, 1938 (divorced 1948), daughter Leticia; 2) Phyllis Hill, 1948 (divorced 1953); 3) the singer Rosemary Clooney, 1953 (divorced 1967), five children; 4) Stella Magee. Career: Moved with family to U.S. at age 6; acted with Princeton Triangle Club, with James Stewart and Joshua Logan; 1935—assistant stage manager for Joshua Logan's stock company in Suffern, New York; Broadway debut in walk-on role in A Slight Case of Murder ; 1940—engaged to direct summer stock at Westchester Playhouse, New York; played lead in successful Broadway revival of Charley's Aunt ; 1943—with Hagen as Desdemona, played Iago to Paul Robeson's Othello in long-running Broadway production of Othello ; 1946—on Broadway in title role of Cyrano de Bergerac ; 1948—screen debut as Dauphin in Joan of Arc ; 1955—screen directing debut with The Shrike ; mid-1950s—made several successful recordings with third wife Rosemary Clooney; from mid-1960s—active in TV; 1983–85—artistic adviser, Coconut Grove Playhouse. 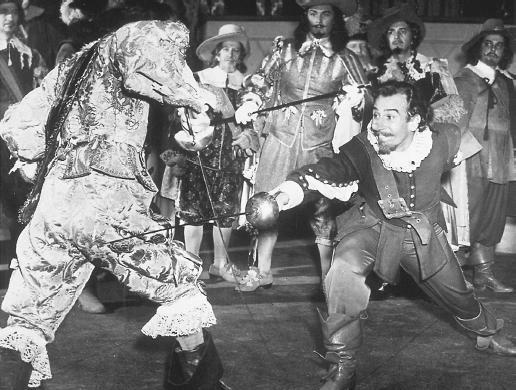 Awards: Best Actor Academy Award for Cyrano de Bergerac , 1950. Died: In Miami, Florida, 26 January 1992. "Cyrano and Others," in Films and Filming (London), July 1962. London, Julie, "The Two Faces of Ferrer," in Films and Filming (London), June 1958. Ciné Revue (Paris), 6 August 1981. Buckley, Michael, "Jose Ferrer," in Films in Review (New York), February and March 1987. Obituary, in Variety (New York), 3 February 1992. Obituary, in Film-Dienst (Cologne), 4 February 1992. Obituary, in Revue du Cinéma (Paris), March 1992. It may be said of José Ferrer's career in films that his prestige outweighs his success. While considered a major actor, and associated with many important films, some of them innovative milestones, others "message" films, Ferrer never enjoyed a consistently satisfying or secure career. Far from denying the decline in his film work since his heyday in the early 1950s, Ferrer later commented, "My entire film career has been dominated by Cyrano de Bergerac and Moulin Rouge . I have learned to live with the situation, but I regret the form my career has taken." In both films the character actor portrayed sensitive souls who had physical deformities. Cyrano was a complex interpretation of a hapless, ugly, unrequited lover who was also a brave iconoclast and sensitive poet. As Toulouse Lautrec, the brilliant Parisian painter who was a dwarf, Ferrer literally went on his knees. Cyrano earned Ferrer an Academy Award, yet some years later he mused that the honor was no assurance of success. He stated bluntly in 1961, "For three years there has been no call for my services as a film actor." Ferrer always preferred to have a strong hand in any production with which he was involved, and naturally turned to directing. He cast himself as the lead in films which he also directed, such as I Accuse , in which he played the persecuted French Jewish Officer, Dreyfus, and The Shrike , starring as the victimized husband. He was always attracted to films with a social message, and objected to the soft-pedaling of the Jewish issue in The Caine Mutiny , in which he was cast as naval lawyer Barney Greenwald. In Ship of Fools he portrayed the Nazi antagonist. Ferrer's quality on film has been perceived as serious, even dour, and he was usually typecast as a "heavy." In the 1970s and into the 1980s Ferrer made several TV films. What others might term supporting roles, or at least "cameos," Ferrer sarcastically called "bit parts, to earn a fast buck . . . the roles where I play the villain or I go up in flames in the end." Ferrer remained active in the theater, acting on and off Broadway and on the road in a broad range of roles; he also did musicals. He directed in New York, in stock and regional theaters, and even returned to work in his native Puerto Rico. Yet, in a 1983 interview he complained that he was reduced to doing TV voice-overs. Ironically, Ferrer's voice and diction were so distinctive and so well known as to render anonymity an impossibility.